All clear glass is crystal! The difference in quality (and price) has to do with how it is formed, finished and decorated. 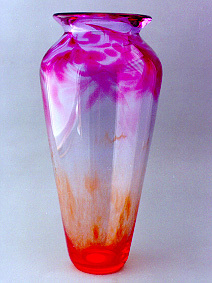 Inexpensive glass is molded. Liquid glass is injected into steel molds. The least expensive product will show a line on two sides of the item where the two sections of mold come together. Molded product may also be finished by removing and polishing the seam left by the mold joint. Molded glass will usually contain "flow" marks in the glass that are characterized by a "wavy" appearance that cannot be removed in the finishing process. 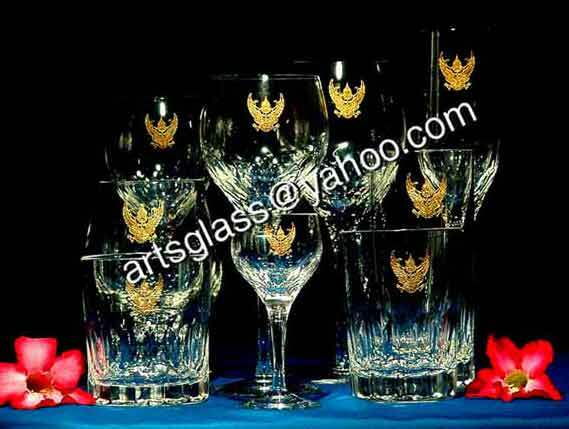 Clarity may also vary considerably depending on the ingredients used to produce the glass. Optic Crystal is lead free with very low iron content. 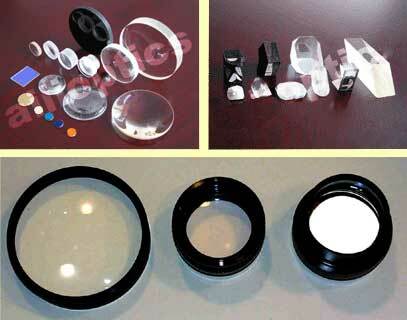 The finest quality of optic crystal is used in the lens of cameras, microscopes, etc. 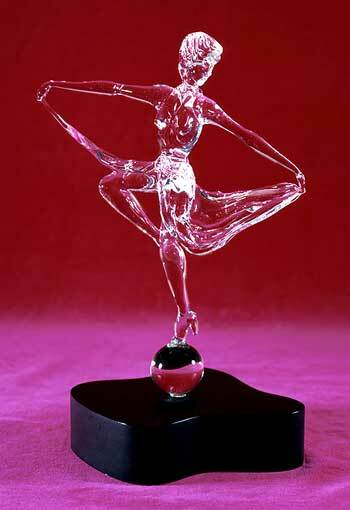 and produces a "water clear" product even in the very thick items used in Awards & Recognition. Although harder than lead crystal, it is not as hard as Jade/Emerald glass. Jade/Emerald glass is produced by adding iron to the basic sand used in producing glass. The green color is quite pronounced when viewed through the edge of the glass and is further enhanced as the thickness of the piece increases. Drinkware is subjected to some of the harshest treatment of all glass and is produced to withstand temperature changes and rough handling. The most desirable crystal is formed by glass blowers. Molten glass is blown into desired shapes but may require the blower to use metal forms to help produce some parts of the product such as the bases of stem ware. 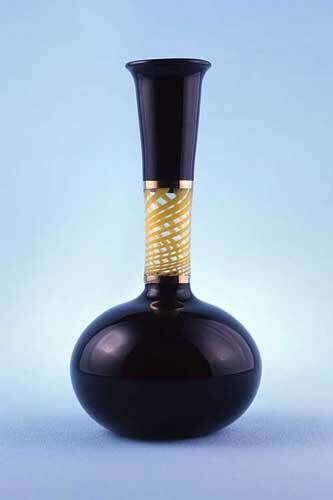 Hand blown crystal will not show any seams and generally will not have the flow marks of molded glass. As with any hand made product, there may be some variation in size from piece to piece. Crystal that is hand cut goes through an additional manual process to apply the decorative design. A pattern is applied to the product and the cutter then grinds the pattern into the glass manipulating the piece against the grinding device until the entire pattern is produced. Glass that has lead added to it is called "full lead" crystal if the lead content is at least 24%. Adding lead to the glass improves the clarity of the glass and assists the blower by helping to keep the glass temperature in the working temperature range for a longer period of time than is the case with glass without lead. 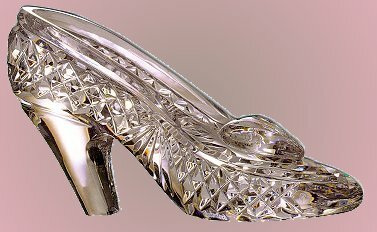 Full lead crystal is used in the most beautiful crystal pieces in the world. Thicker pieces may show small bubbles that are not considered to be flaws. For use in Awards and Recognition, a message must be applied to the crystal stating the nature of the award and often with the recipient's individual name applied to the product as well. The two most common ways of doing this is with laser engraving and "deep etch" engraving. 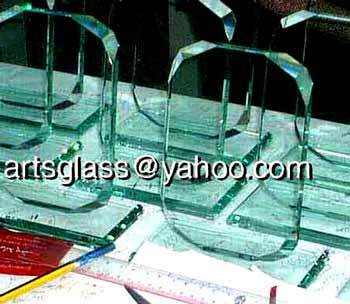 Color Cut Crystal is produced by applying thin layers of colored crystal to a clear crystal base. Skilled glass cutters cut through the colored layer to create magnificent contrasts. Colored crystal is produced by adding various minerals to the molten glass. The red or cranberry color, for example, requires real gold, which generally requires it to sell at a premium price. 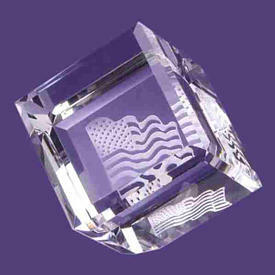 Laser engraving produces an image that is barely anything more than a surface "scratch" on the crystal. 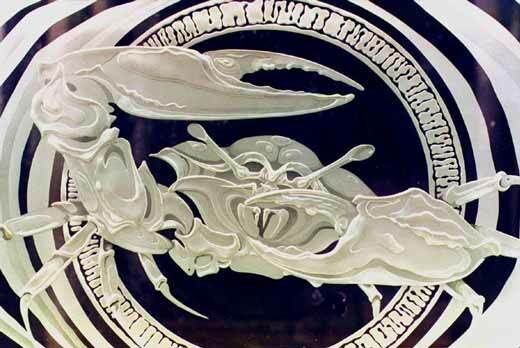 The heat generated by the laser prevents cutting the image deeply into the glass so the etched image does not have the high contrast "whitening" that occurs with the deep etch technique. Laser engraving costs less to produce and the reduced cost may help some buyers accept the lower quality image. Deep etch engraving is a labor-intensive process. After art is created for the image to be reproduced, a "mask" is made for each piece that is to be engraved with the same image. Even the most minor change in the image requires a new piece of art and a new mask. Because deep etch engraving is a sand blasting process, the mask is made to protect the piece from contact with the abrasive everywhere except where the image is to be engraved. The mask is made in a photosensitive process similar to making a silk screen. After "washing," a separate mask is hand applied to each piece to be engraved along with additional material that helps protect more of the product from the engraving abrasive. Each piece is then engraved by a skilled technician using the proper abrasive required for the specific image, applied for just the right amount of time to produce a sharp "white" image on the crystal. The mask and protective material is then stripped from each piece and the cleaning process is finished by a trip through a commercial dishwasher. From here on, the crystal is handled by "gloved" hands through the packing process to assure that it reaches its destination without fingerprints! Custom product is possible only at great expense. Custom molded product requires molds in the $30,000 and up price range and require quantities of 50,000 pieces or more. Hand made product can be made in smaller quantities but still involves a significant investment in both money and time.